The global advanced wound care market is predicted to grow at 6.0% CAGR during the forecast period with the market size reaching USD 16.0 billion by 2024. Advanced wound care products are used for the treatment of chronic and acute wounds. These products manage wound effectively and enable faster healing. Different products such as advanced, wound therapy device and active wound care products are majorly contributing to the advanced wound care market size. The market has witnessed significant demand for advanced over the last few years due to the mounting occurrence of diabetes-associated ulcers, pressure ulcers, and venous leg ulcers and intensifying need for inventive & innovative wound dressings for the treatment of such wounds. Based on products, the advanced wound care market is categorized into, advanced, wound therapy device and active wound care products of which advanced hold the largest share and is expected to grow at fastest rate in the advanced wound care market, globally. The mounting occurrence of diabetes-associated ulcers, pressure ulcers, and venous leg ulcers and intensifying need for inventive & innovative wound dressings for the treatment of such wounds led to the fastest growth of the advanced during the historical period, which is also predicted to continue during the forecast period. The advanced segment is further subdivided into foams, films, hydrogels, hydrocolloids, superabsorbent, wound contact layers, alginates, collagen, and hydrofiber. Among the entire advanced segment, foams segment accounted the largest share and is expected to grow at the fastest rate in the market. In addition, the wound therapy device segment is further subdivided into an electrical stimulation device, negative pressure wound therapy (NPWT) device, oxygen & hyperbaric oxygen equipment, and others. Among the all wound therapy devices, the NPWT device segment accounted the largest share in the market and the oxygen & hyperbaric oxygen equipment segment is expected to grow at fastest rate in the market. Moreover, active wound care products are further subdivided into topical agents and artificial skin and skin substitutes. Among both active wound care products, the artificial skin and skin substitutes segment accounted for the larger share and is expected to grow at the fastest rate in the market. On the basis of the application, the advanced wound care market is segmented into surgical wounds, diabetic foot ulcers, pressure ulcers, venous ulcer, and burns. Of all, the surgical wound category is accounted the largest share in the market and is predicted to witness the highest CAGR during the forecast period due to the mounting occurrence of post-operative surgical wounds, and expanding occurrence of diabetic foot ulcers and pressure ulcers. On the basis of the end user, the market is segmented into inpatient and outpatient. Of all, the advanced wound care market size for inpatient is expected to grow at the faster rate during the forecast period, globally. Expanding geriatric population, mounting occurrence of diabetes, escalating occurrence of wound ulcer and surgical wounds, escalating research and development activities, introduction of novel treatments for advanced wounds, favorable reimbursement scenario, and technological advancement in advanced wound care products are the key factors leading to the growth in the advanced wound care market, globally. Owing to the mounting occurrence of wound ulcer and surgical wounds has resulted in increased demand for advanced wound care products for the management of the wounds and to reduce the length of stay in the hospital. Some of the other key factors driving the growth of the industry are the mounting adoption of evidence-based treatment for chronic wounds, escalating healthcare expenditure, and awareness programs for advanced wound care treatment and management. Key factors hindering the growth of the advanced wound care market are the high cost of advanced wound care products and lack of awareness of advanced wound care products. Geographically, North America is the largest advanced wound care market due to the introduction of novel treatments for advanced wounds, and escalating healthcare expenditure. In addition, expanding the geriatric population, technological advancement in advanced wound care products, the upsurge in the prevalence of chronic wounds, and mounting occurrence of diabetes are also fueling the growth of the North American advanced wound care market. For instance, according to the study conducted by National Center for Biotechnology Information on Challenges in the Treatment of Chronic Wounds in 2017, in the U.S approximately 2.4 million to 4.5 million people were affected with chronic lower extremity ulcers wound in 2013. 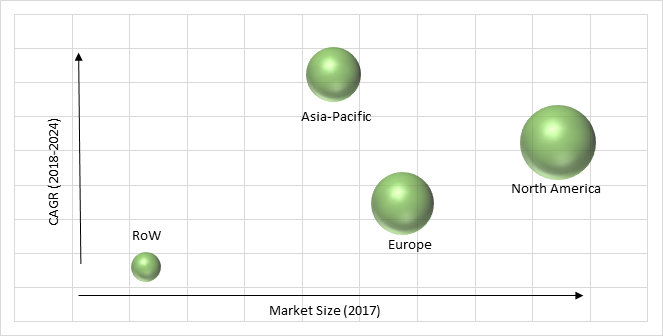 Asia-Pacific is observed to witness significant growth in the advanced wound care market during the forecast period, as the region comprises a large population, and escalating government support. Moreover, expanding the geriatric population, the mounting occurrence of diabetes, escalating healthcare expenditure, intensifying medical tourism, growing demand of advanced wound care products, and mounting occurrence of surgical wounds are also facilitating the significant growth of Asia-Pacific advanced wound care industry. Market players in the advanced wound care industry are investing capital to develop technologically advanced systems. In June 2018, Acelity L.P. Inc., acquired Crawford Healthcare, to expand its product portfolio of advanced wound dressings. Smith & Nephew, 3M Company, Medtronic Plc., Mölnlycke Healthcare (A Part of Investor AB), Coloplast Corporation, Paul Hartmann, Cardinal Health, B. Braun, Mimedx Group, Convatec Group, Integra Lifesciences Holdings Corp., and Acelity L.P. Inc. are some of the key players offering solutions for advanced wound care. 10.11. Integra Lifesciences Holdings Corp.
Table 170 Snapshot – Integra Lifesciences Holdings Corp.
Table 170 Snapshot – Acelity L.P. Inc.